For me, writing was always a good way to release the steam. Especially as a business school student, you can come by some pretty crazy stuff, whether its study-related or school life-related. There was a time when I decided to write about stuff that angered me & just mocked it with a very cynical approach. But as time went by, I matured a bit & learned how to better appreciate some annoying aspects of my life or even to just simply ignore them. I felt kind of relieved but the problem was I couldn’t supply my former blog with any new material, since I didn’t feel like giving too much importance to my rants. This is why I stopped writing for a long period. Up to now, you might be wondering what does this have to do with video games. Well, IMO, it’s kind of the same deal. When I was younger, I used to play video games just to relieve all the tension from school work & family obligations. This is why I started to take a liking to platforming, beat’em-up & fighting video games, where you had to break your balls in order to reach the end of a level or win a few rounds. As a matter of fact, a lot of my first video games belonged to these three genres. On my first gaming system, the Sega Megadrive (or Genesis as it is referred by in North America), the very first video games I ever laid my hands on were Sonic the Hedgehog (well, gee, what a big shock!) 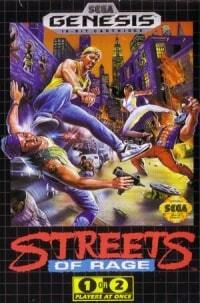 & Streets of Rage. Oh yeah. Playing as vigilantes in bright & tight clothing is so badass. When I moved on to the fifth generation of video game consoles, my first game on the PlayStation was Soul Blade, followed closely by Crash Bandicoot. Oh, Soul Blade… I remember perfectly the opening sequence of this game… Just hearing the first notes is enough to send chills down my spine. And don’t even get me started on how it was satisfactory to disarm an opponent & perform a Perfect or a Ring Out. Hell, even on my Dreamcast, the games I spent most of my time playing were Sonic Adventure, Sonic Adventure 2 & Soul Calibur. I’m not saying that I didn’t care about the plot or characters. It’s just that I found more pleasure in busting my balls on a video game with all the frustration that came with it. Rushing through all the levels you’ve already done billions of times just to get all the hard-to-reach trophies was fine with me. You know what I’m talking about, Crash Bandicoot fans? If the plot was convincing – and I mean, not too silly – , that surely was a big plus, but it wasn’t mandatory. This is why I wasn’t a big fan of RPGs when I was a kid, especially the turn-based ones where you had to go through some sub-menus in order to select a specific action for each one of your characters. And don’t even get me started on the first hours of your basic JRPG, where it’s very story-driven and you have to go through a lot of text in order to grasp the game mechanics. I just wanted quickly a piece of the action. Right here, right now. When I grew up, you could say that I learnt how to better appreciate video games. It wasn’t anymore just a simple leisure like watching TV or playing outside with friends. I feel now like I’m beginning a new adventure in a whole new world, every time I put a freshly bought video game in my console. You know that kind of feeling, right? When you’re looking carefully at the opening cinematic for the first time, and where you try to pick up everything that’s specific to the adventure you’re going to experience : main protagonist(s), antagonist(s), setting, time period, some bits of the plot, etc. Now is the time where I feel that my approach to writing has evolved in the same way as my approach to video games. No don’t worry, I won’t claim that I wish to become a writer… If you’ve already met me, you’d know that it’s clearly not my style. What I mean is that I want to write because I wish to express thoughts & feelings & to experiment & explore new dimensions. Clicking on “New Post” on a blog has become more like pressing the buttons on your controller when “Press Start” is flashing on your TV screen. Some people told me that they appreciate my style of writing. I’d be lying if I said that writing bored me now. I just needed to find a perfect subject to write about on this blog. Since playing & discussing video games are one of my most important leisures, I’ve felt that associating those two -writing & video games- would help me keep an interest in writing. Enjoyed reading this post and looking forward to reading the rest of this blog! Thank you for the nice comment, Sriram! When it comes to video games, everyone has his own word to say or memories of playing some classic titles. This blog is just a kind of formalized way to express my deep interest in the gaming industry. I know it’s a very specific topic to deal with, but I hope I can keep people like you interested into reading my articles.